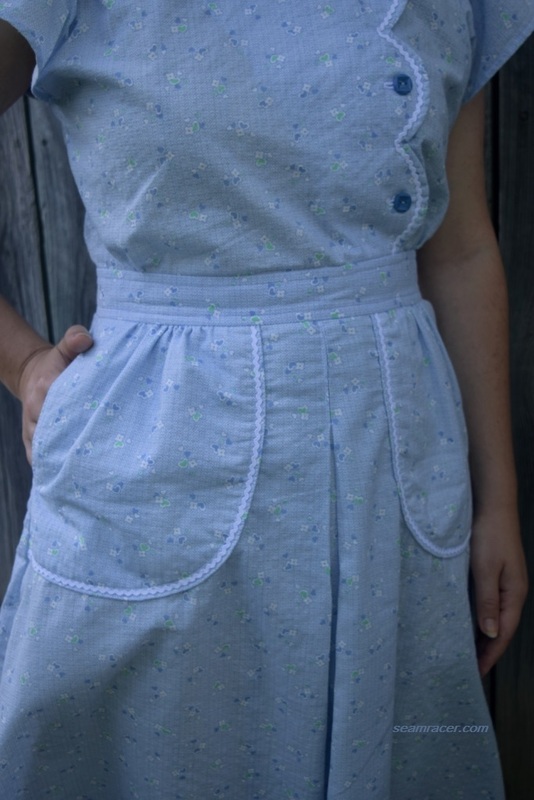 I must confess, a sundress is something I very much enjoy making, especially when it comes to patterns with interesting details that challenge my sewing skills. Fun, feminine, and perfect for scorching weather, the perfect sundress for me also lets my skin enjoy some air and sun…which is good for my spirits because I am by nature a warm weather-loving girl. 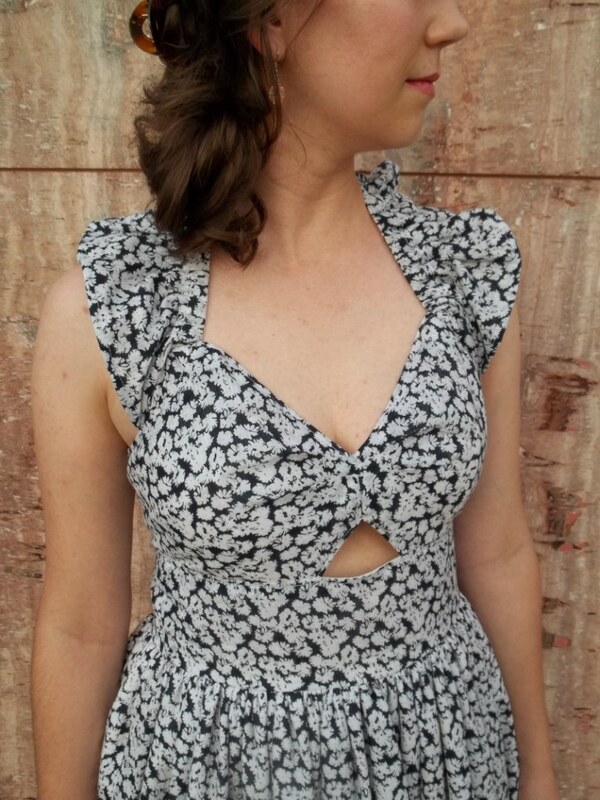 My newest magazine from Burda Style, as well as a contest on their blog site and a “Sundress Sew-a-long”, enticed me to sew up one of their designs – a ruffled, halter neck, vintage inspired sundress. 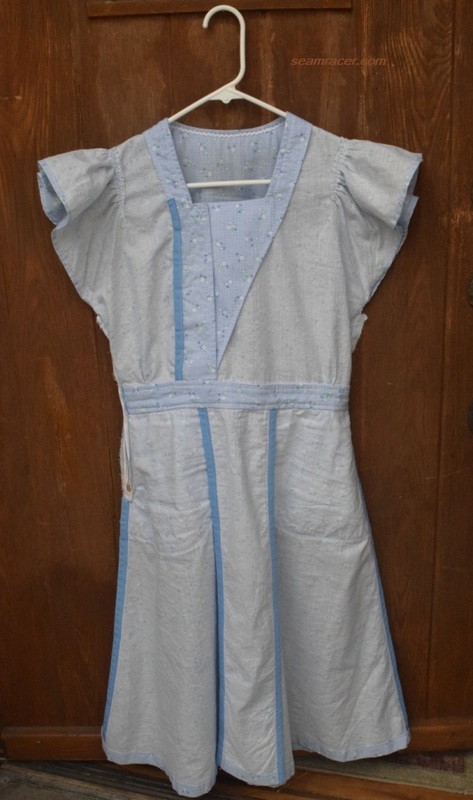 Excellent construction method laid out in the instructions, as well as a wonderful design, made sewing this sundress turn out as a satisfying success. 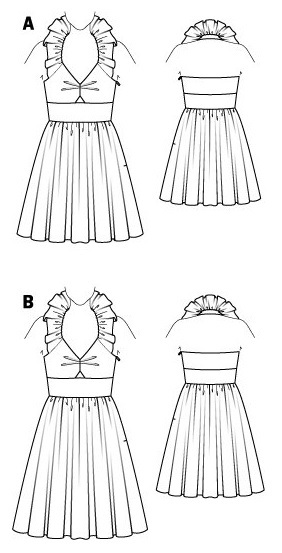 The predominant details showing off are the ruffled and gathered elastic halter strap, the cut out and pleated bodice, and a full gathered skirt. The full lining of the inside makes for a clean and professional looking garment, not to mention being comfy on the skin. I’m very happy with my finished dress. 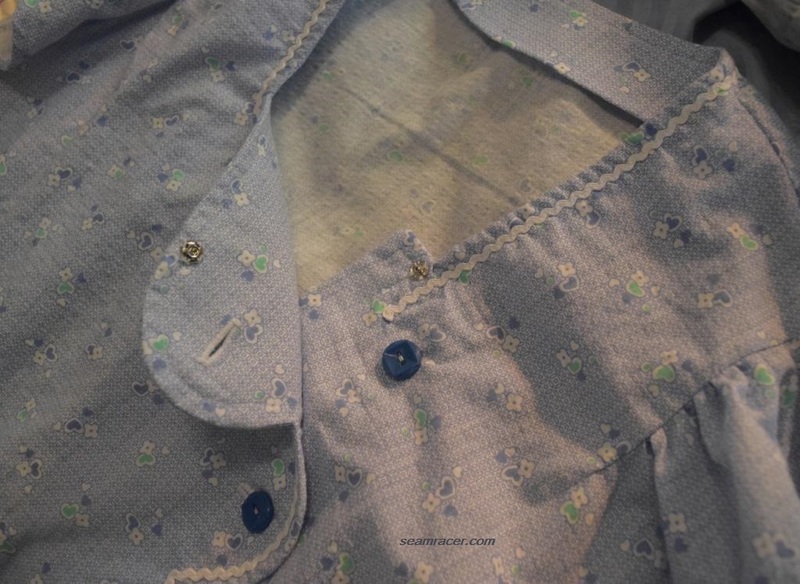 FABRIC: The floral fabric for my dress is a very lightweight and sheer printed 100% cotton gauze. It is hard to see unless I am in the outside light, but the print has a dark navy background with white flowers and a very faint pink center spot in the flowers. My dress’ lining fabric for the entire upper bodice half is a basic but soft white bleached 100% cotton muslin. 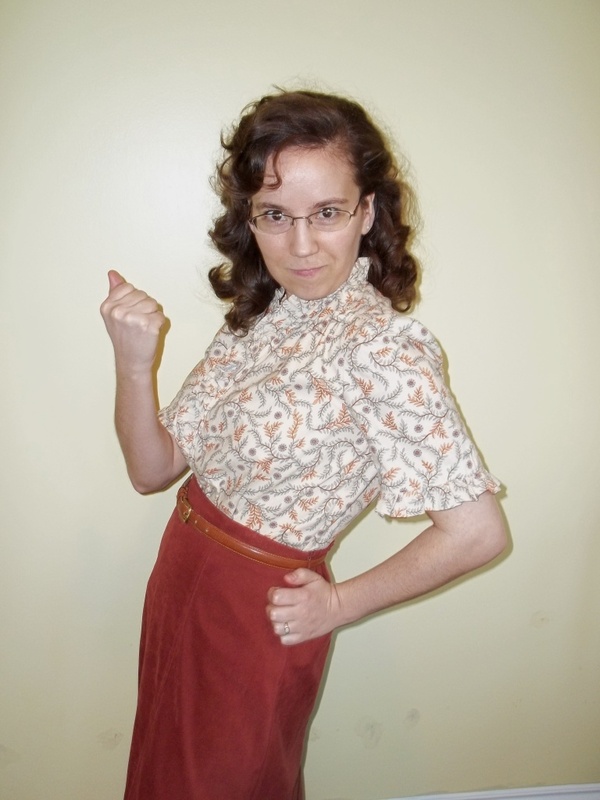 The skirt portion of the lining is a 100% polyester pongee cling-free fabric. NOTIONS: All I needed was plenty of thread, some stay tape mesh ribbon, and a zipper. The interfacing was omitted. The zipper was the only notion bought. 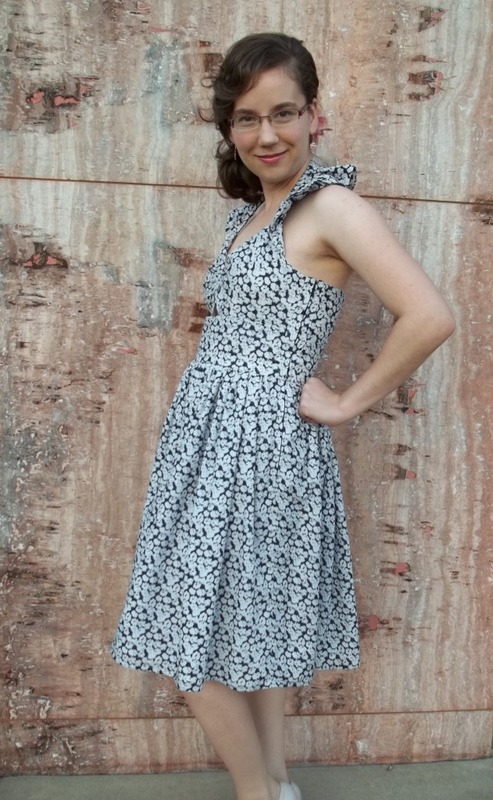 PATTERN: Burda Style Halter dress with Ruffles 04/2015, numbers 111B and 111A. The difference I can see between A and B are one is shorter, one is longer. I chose a skirt length between A and B for my dress. 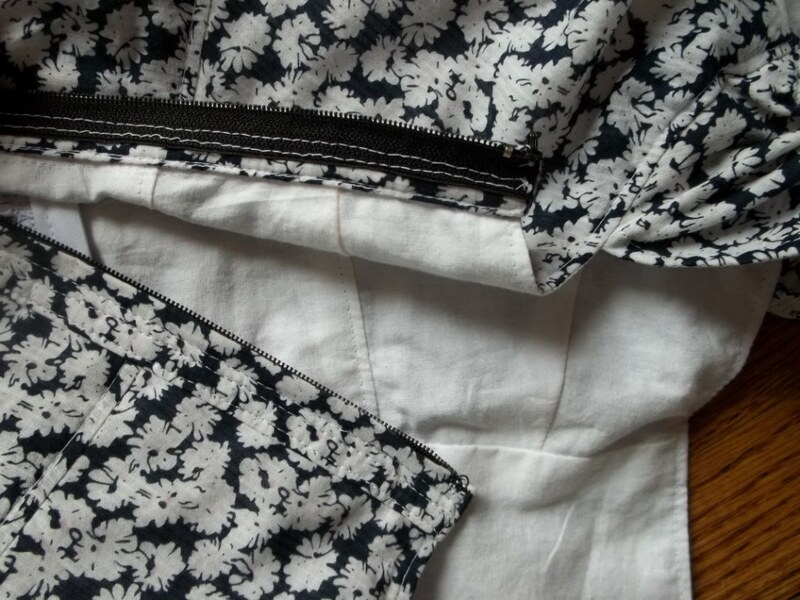 THE INSIDES: Almost all inside seams are covered by the lining. The only slight change I made to the original instructions was to cover the waist seam in bias tape instead of keeping it under the skirt lining. TIME TO COMPLETE: In total, I spent 10 to 15 hours of “enjoyment” on my dress. It was finished on June 20, 2015. TOTAL COST: I got by with 1 5/8 yard of floral gauze fabric for my dress, and the muslin and pongee linings came from my stash. The floral gauze had been bought at a Hancock Fabrics store a month before intended for another different project, so it was kind of on hand as well. 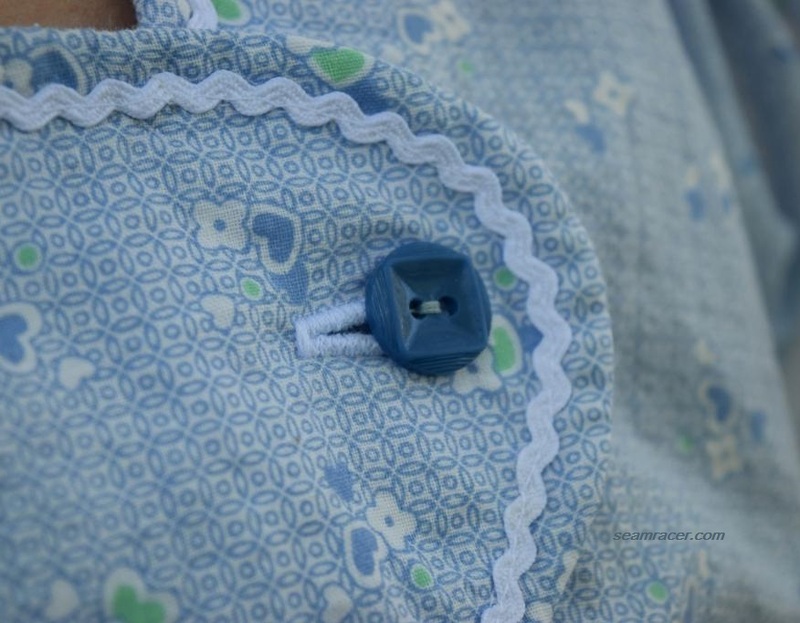 Anyway, in total my dress probably cost (for floral gauze fabric and a zipper) a total of $15 to $20. 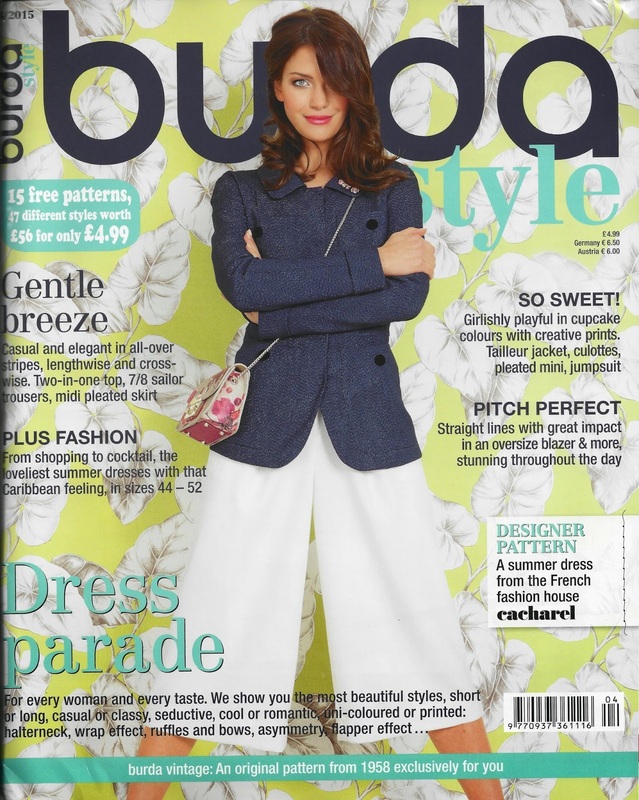 My pattern had come from the April 2015 magazine issue (cover image at right below), but a downloadable version of the halter neck sundress is also available on the Burda Style website. 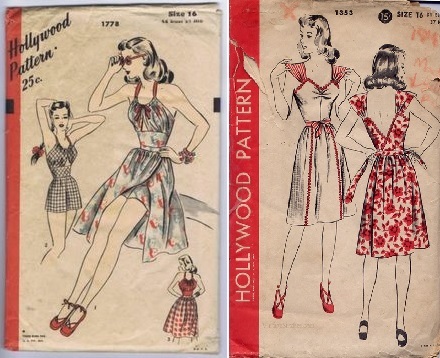 Either way, the Burda patterns (for those readers who don’t know) need some assembly and tracing before being ready for layout on your chosen fabric. A scissor with a magnetic ruler guide helps immensely to quicken along the step to getting a finished pattern prepped. This is the stage where I pick out my size, tracing out only the size I need to use, including any grading and adding seam allowances. 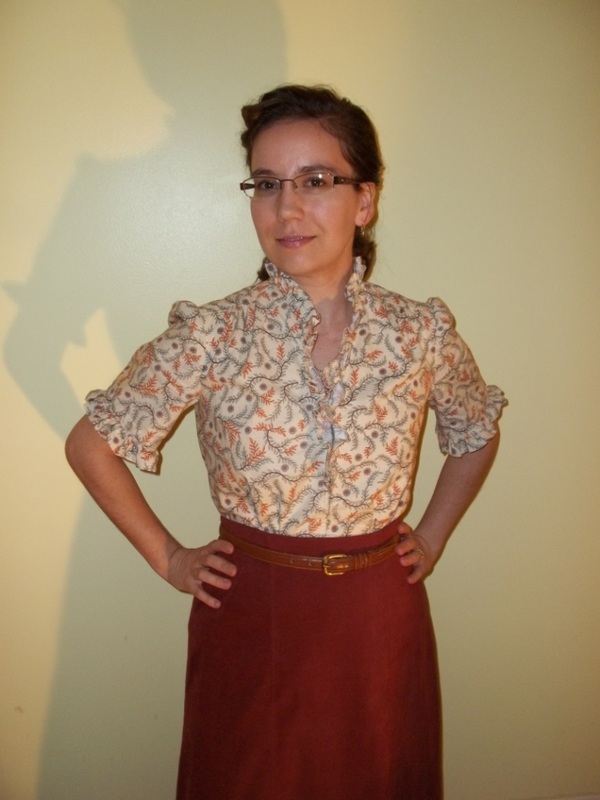 For this pattern, I actually went down a size in everything from the normal size I choose for myself from Burda Style. Looking at the model’s version, I noticed it looked a tad roomy on her. I wanted mine to be tailored more tightly as I am generally on the small size when it comes to fit. Going down in size really gave me the perfect fit, I believe. 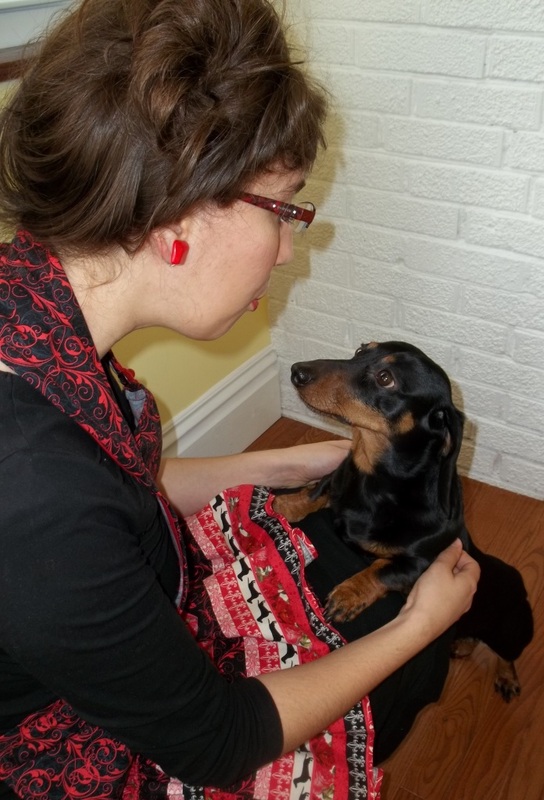 Take note – the pattern is also sized for petites. I did not change this but made it “as is” since I am right on the high end of the height limit for that category. 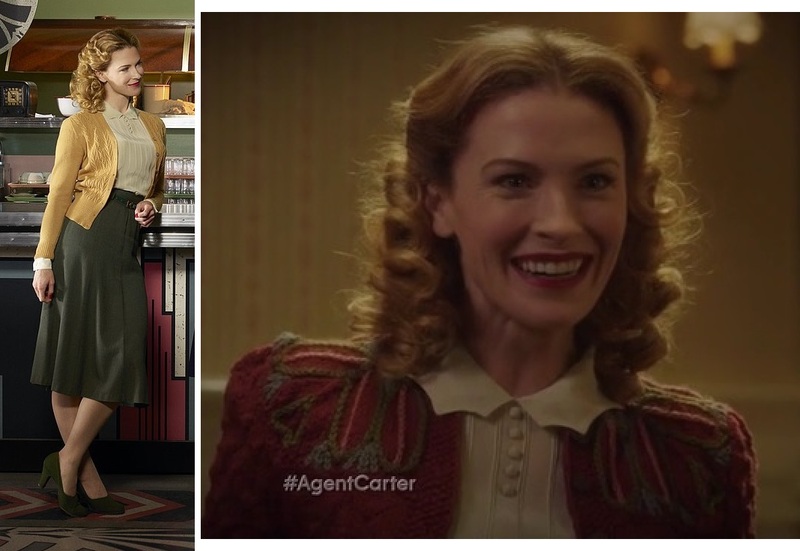 In my mind, see this pattern as decently easy to grade out of a petite size, nevertheless. 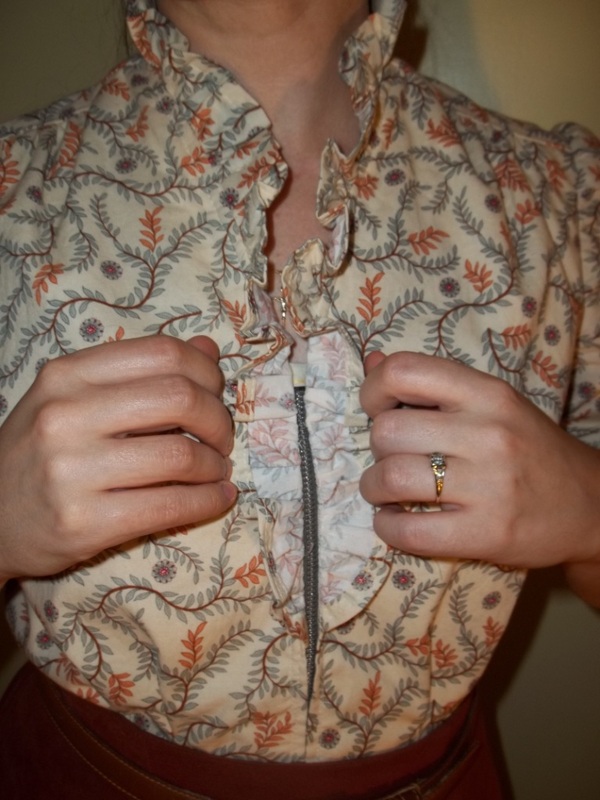 Whether wrong or right, I would have added the necessary height into two spots: the lower bodice bands and the upper bodice just under the bust. 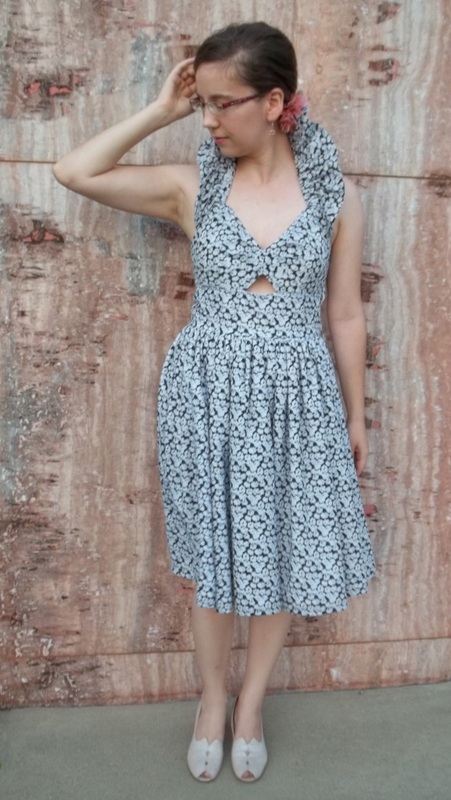 I am happy with the height proportions of the finished dress on myself and think anyone about 5 foot and 3 to 5 inches can get away with it being petite. 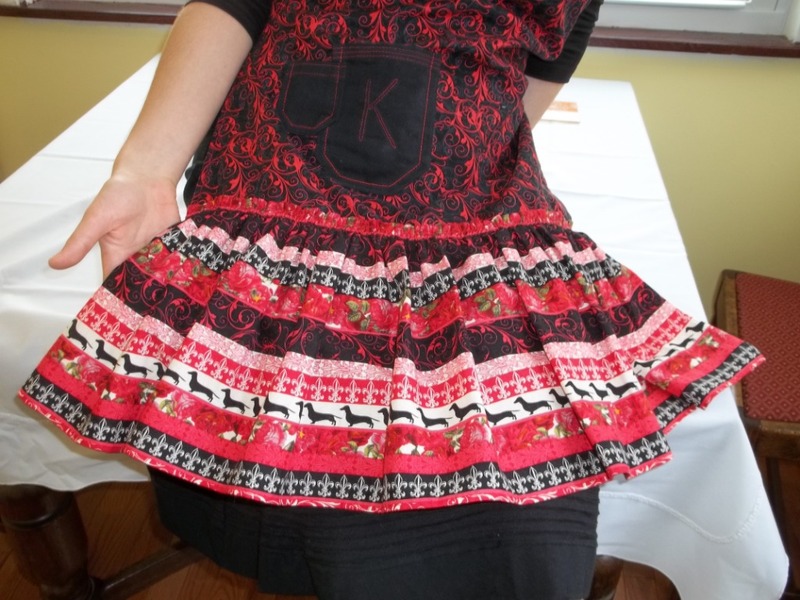 There were just a few slight things that I personalized to make my dress. 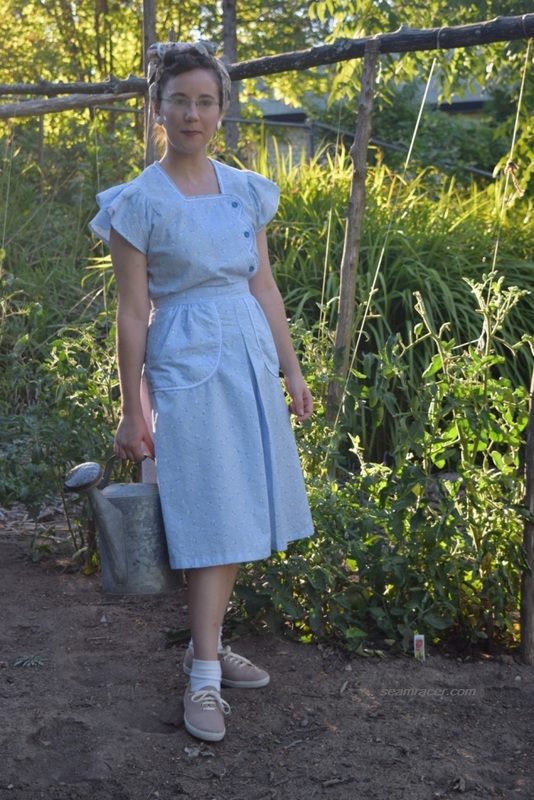 I wanted to go with the feel of the soft cotton gauze fabric and have a dress that has an overall softer and easy theme to the way it wears on myself. 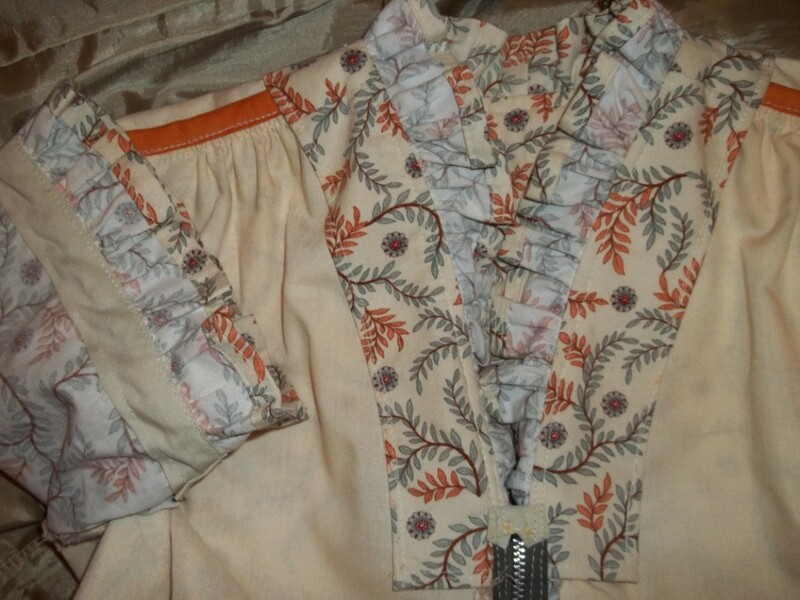 Thus, as I briefly mentioned above, I eliminated the interfacing called for in the entire bodice. 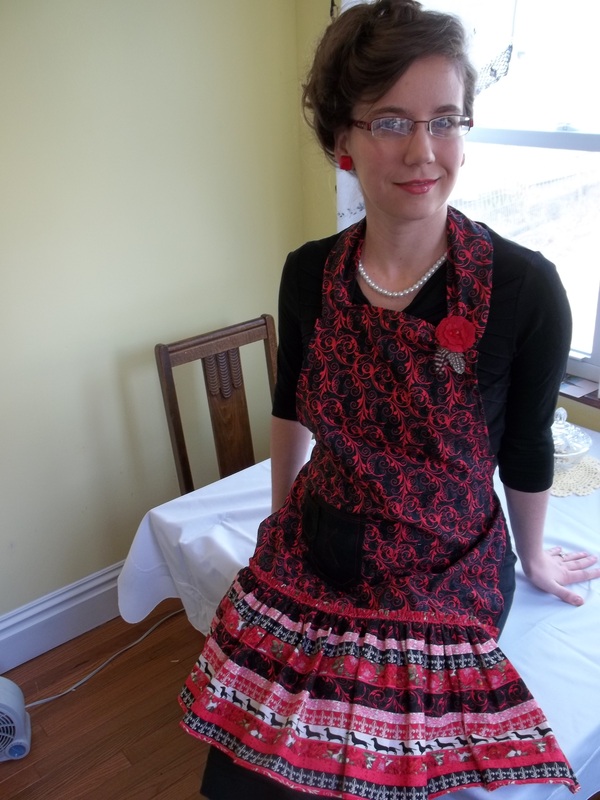 My sundress still holds its designed silhouette, but it just makes it more of what I exactly wanted to make. There is stay tape in the seams to keep the cotton in its original shape since I didn’t use interfacing. 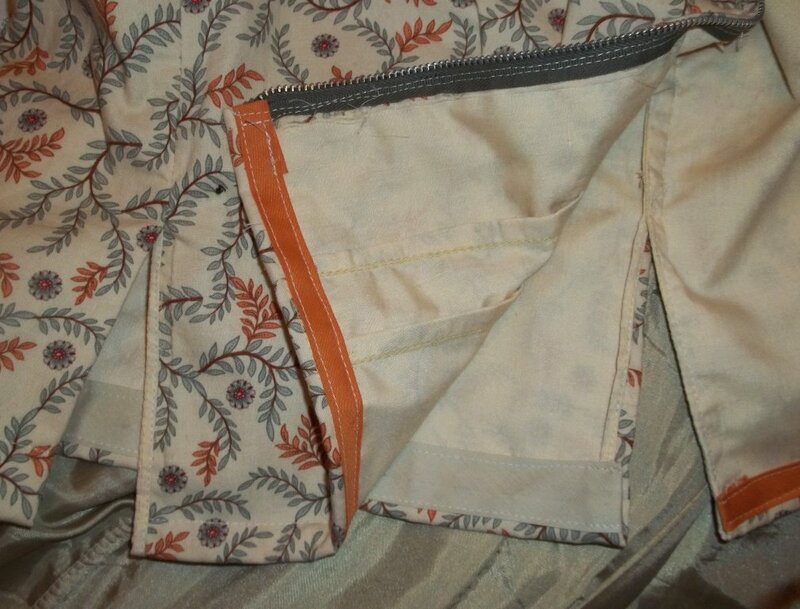 I also added a small self-drafted bias tape to support and finish off the left side edges where the zipper gets inserted. 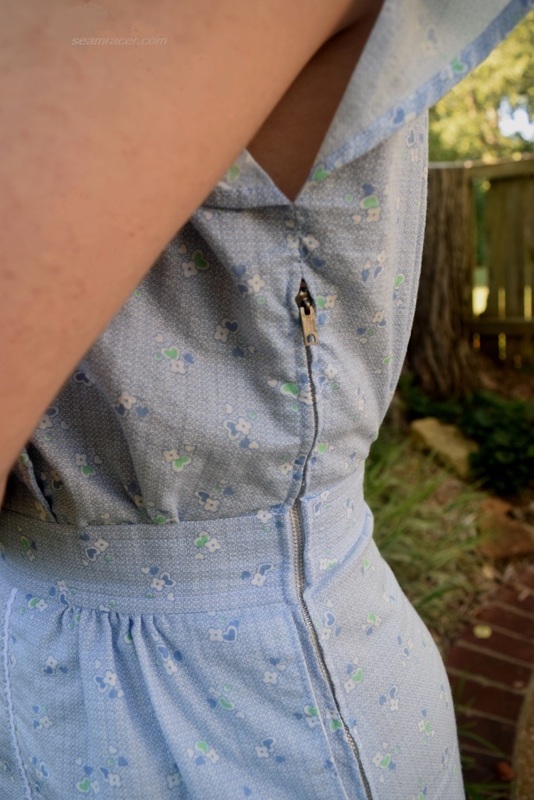 The self-fabric edge tape blends right into the rest of the dress and is barely noticeable, but gives me a tad more comfort by providing a little more room as well a peace of mind that the zipper seam will not tear the thin fabrics of my dress. 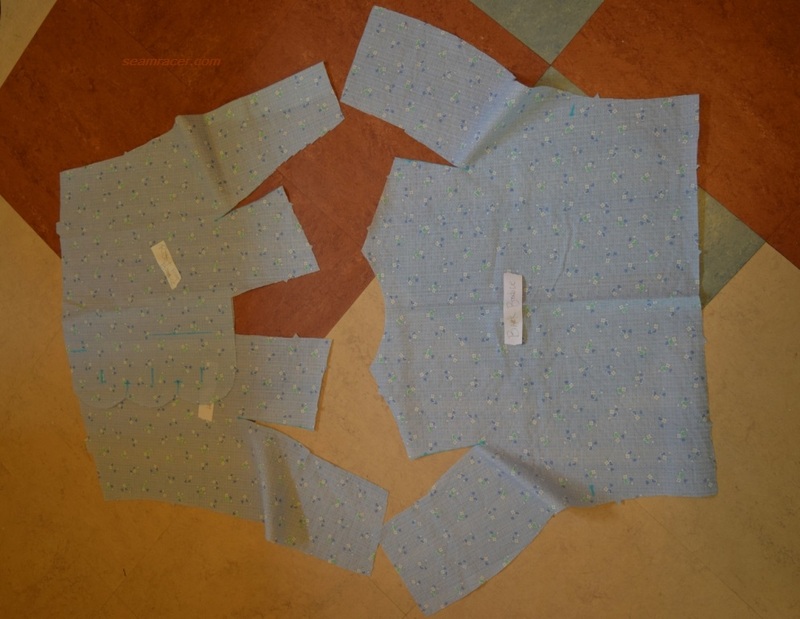 Also, as I was working with half the amount of fabric as the pattern called for, I was able to cut all the other pattern pieces out correctly by cutting out the halter ruffle piece on the straight grain (vertically to the selvedge) rather than the bias. The ruffle gets gathered anyway, so I figured correctly that changing the grain line wouldn’t affect all that much. Finally, as there is so much gathering at the waistband, I do have an exposed seam there but it is nicely covered in bias tape. No major design changes or alterations to the style was done otherwise. 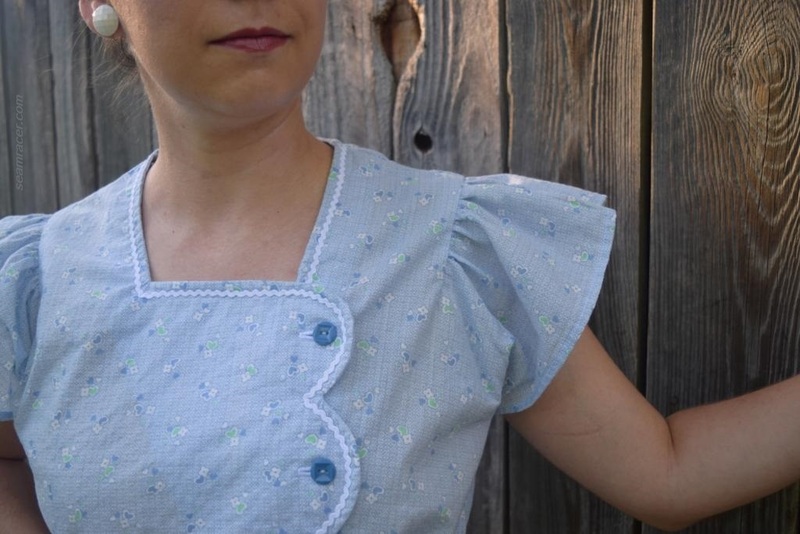 Burda Style’s Ruffled Halter neck dress pattern is challenging enough to be good to sew without being hard enough to be frustrating or impossible. 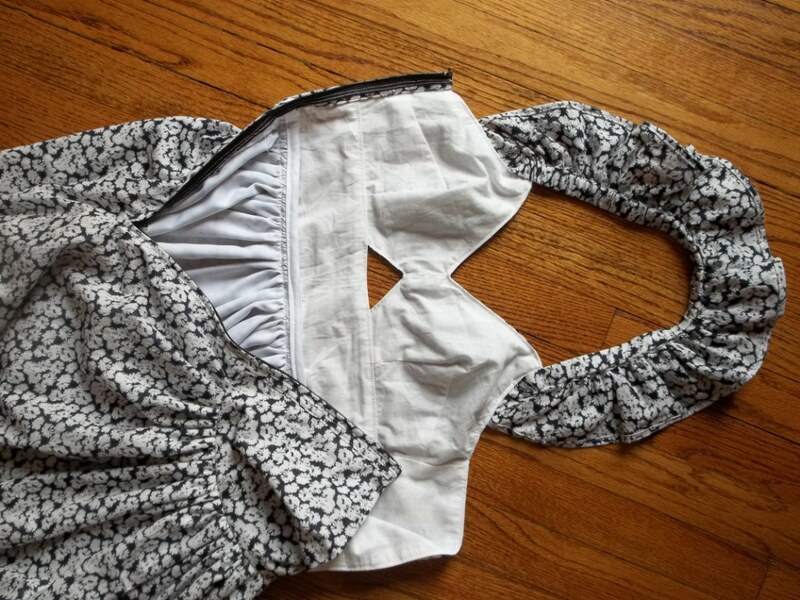 The bodice and ruffled strap just came together before my very eyes after just doing the first few parts (1, 2, and 3), as you can see in my pictures. 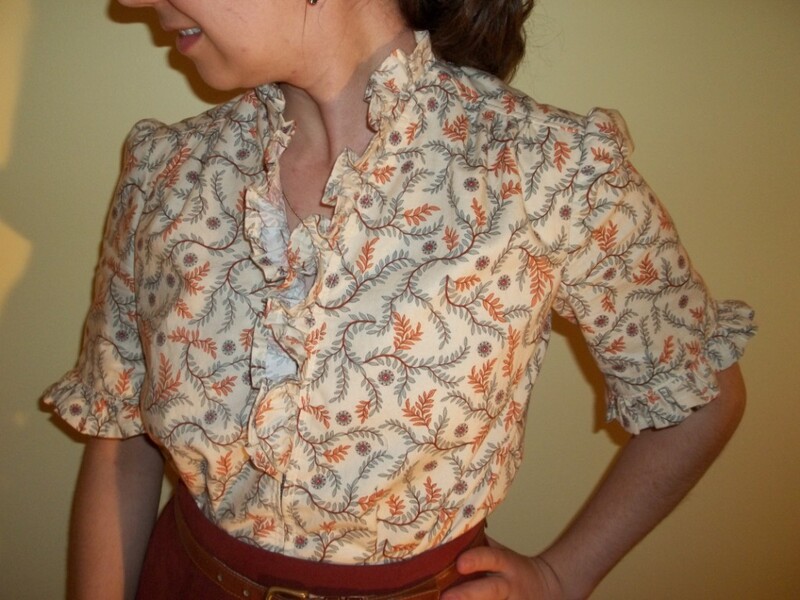 I did get lost as the how the exactly finish off the ruffles’ edge, so I decided to just make a ¼ inch hem. 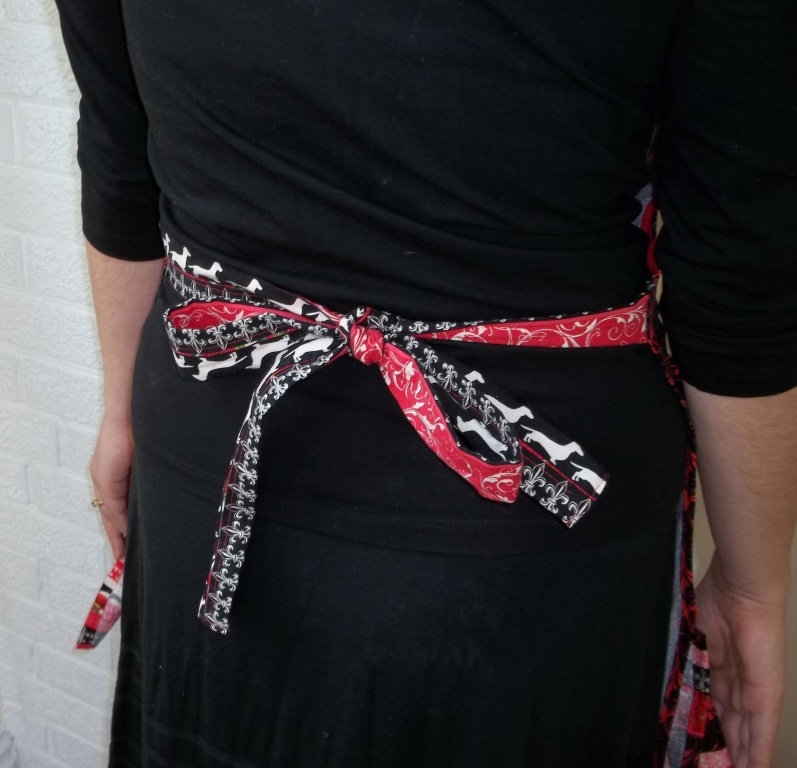 Having the strap be a bias strip with a ruffle, and then adding elastic and gathering it too is very intriguing and creative to me. At first, I was afraid the strap was going to be uncomfortable, tight, or confining to wear, but – no, it’s not at all! Burda Style’s measurements for the elastic length in the strap is perfect to be taut but still comfy in my opinion. 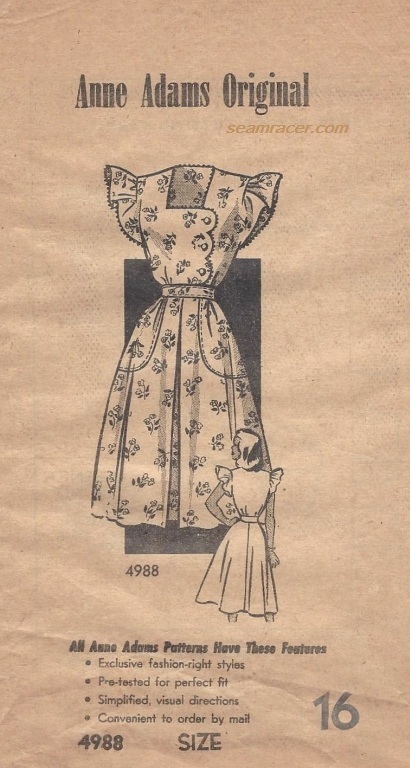 There are two looks to the halter neck sundress. If I have the elastic in the halter strap lay flat along my neck at the top of the shoulders, then the ruffle lays down, nice and tame. 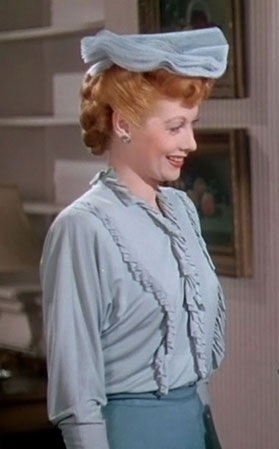 If I roll the elastic up so the halter strap lays up against the back of my neck, then the ruffle is frilly and perky, like a modern Elizabethan ruff. 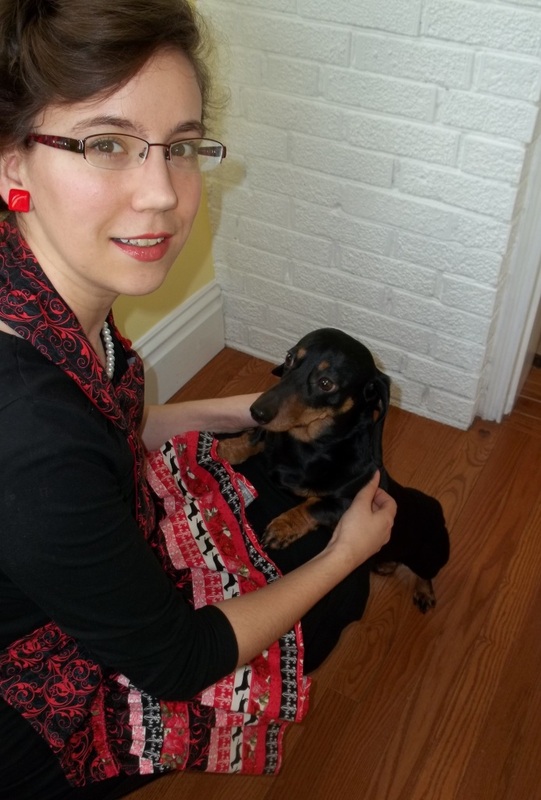 On the Burda Style page for the pattern, there is this summary, “This dress will turn heads when you walk into the room. It has a close fitting bustier with a full skirt with wide waistband, like the iconic Fifties silhouette. 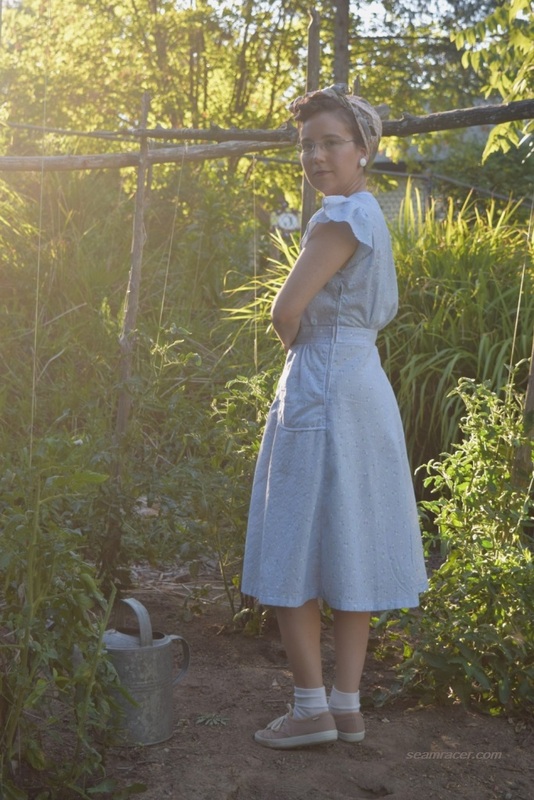 The most eye-catching trait is the wide riffled halter strap that hugs the neck.” This summary obviously fits this sundress into my “Retro Forward” blog post series. To me (and hubby), this sundress seems like a mix of several decades of vintage touched with a slight futuristic appeal. 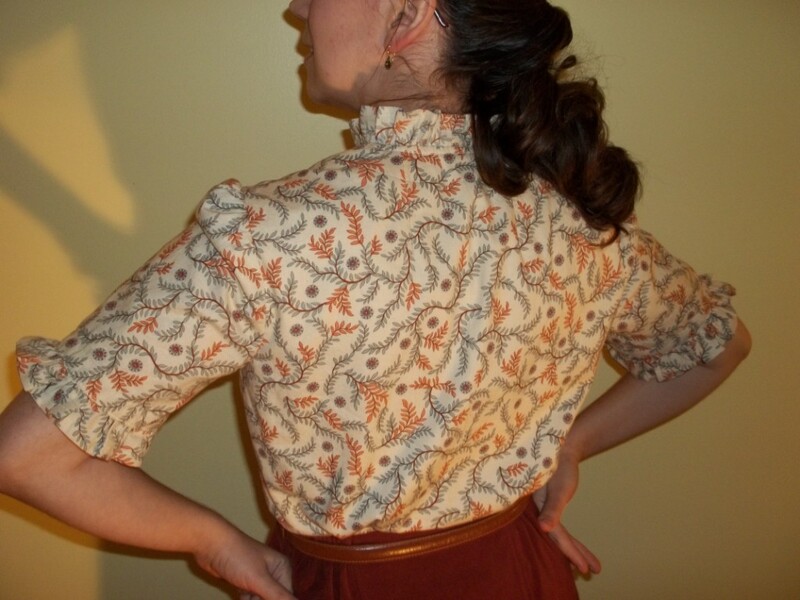 I have not been able to find a clear past trend for ruffled neckline that wrap around the neck, except for some briefly recurring fashions of this style in the 1960’s and 1970’s (see this dress and this pattern). 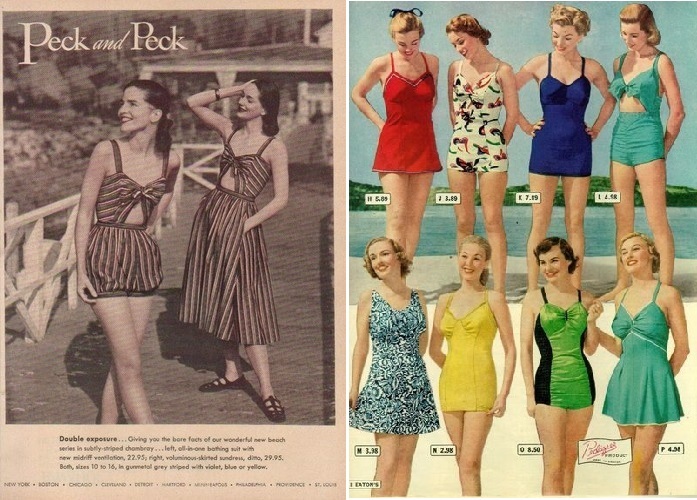 The trend of summer swimsuits and sundresses with an under bust cutout can be found through the 1940’s and 1950’s. 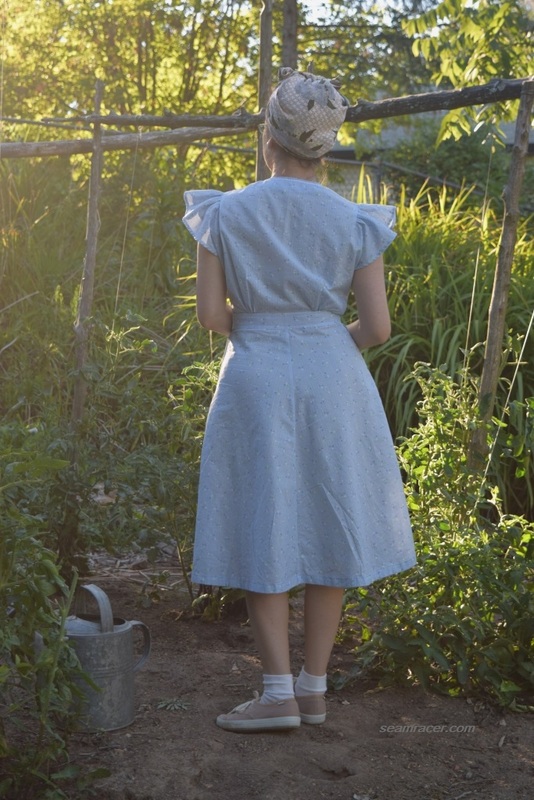 There is a modern counterpart pattern which reflects the design of my Burda ruffled halter sundress – see Simplicity 1371. 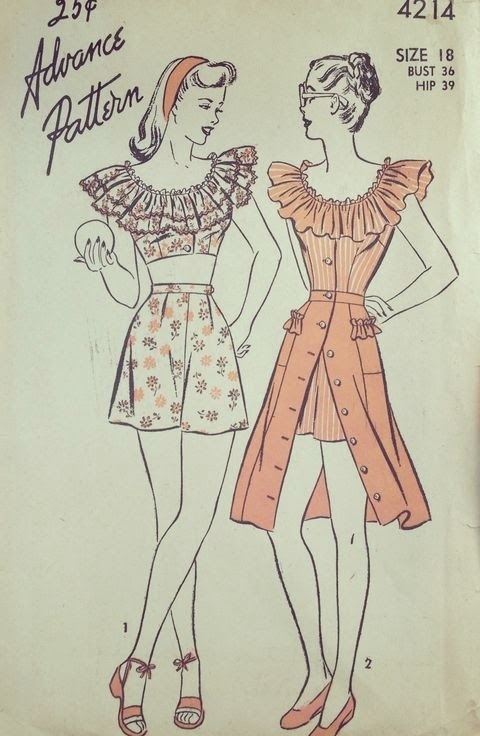 It seems that the “midriff ventilation” trend was most popular and widely seen between the mid to post-war 1940’s into early to mid-1950 decade. 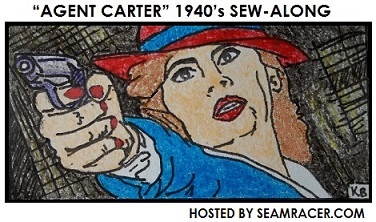 See my inspiration collage of patterns and old advertisements below for examples. 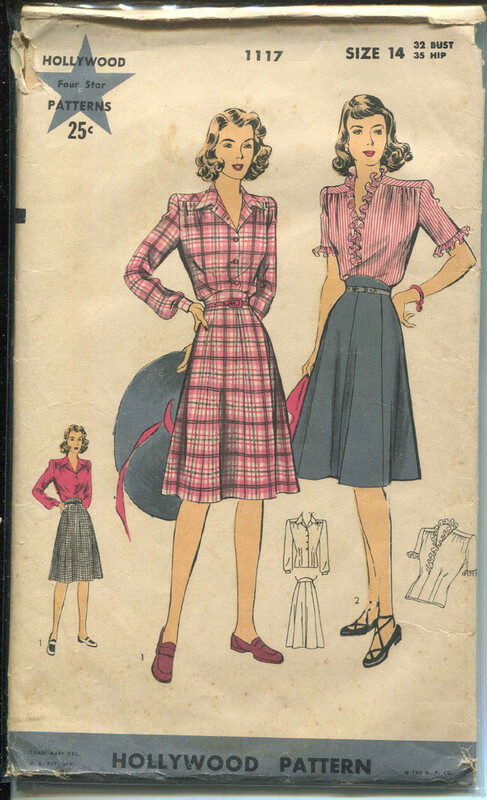 The full skirt trend was also popular in the 40’s (and 50’s too, as an option to the “wiggle” slim skirts of the era), as was the wide close fitting waistband and pleated bustier center front detail. 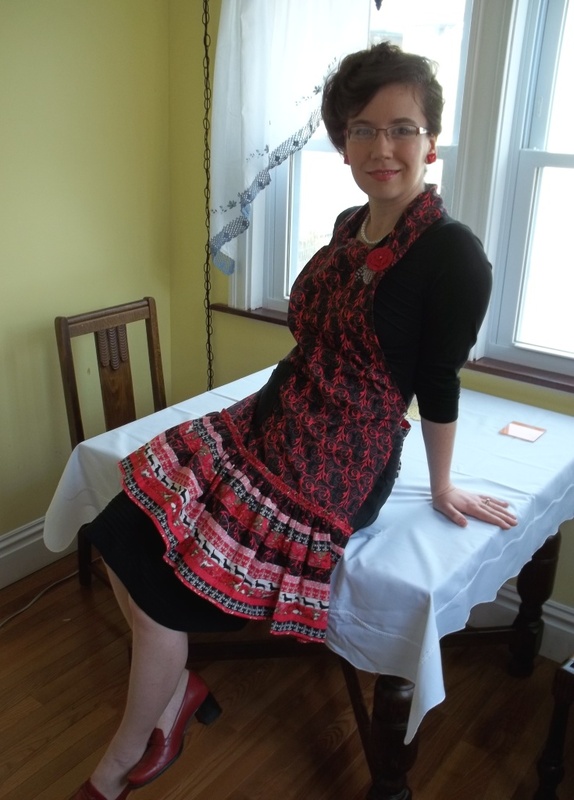 My new Burda Style sundress is ready and waiting for warmer days and special occasions. I did get to wear my dress so far to some uneventful occasions in our first heat of the summer. Behind me in the pictures of our photo shoot, you can see some beautiful pink/peach Italian Travertine rock that is part of a distinguishing building in our town, the Lindell bank. So often it has the nickname of being the “Art Bank” because of its beautiful and obviously large statues flanking the sides of the building. I love how the muted calming colors of the building and the peaceful, nature-themed statues offer a moment of calm to what is one of the busiest trafficked intersection in our area. 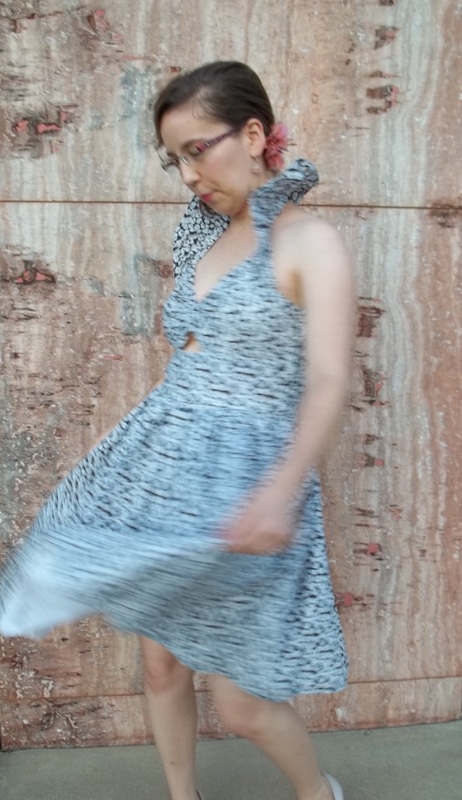 Come to think of it now, the “Art Bank” reminds me of my new halter neck sundress. In the way the “Art Bank” behind me in my pictures is a thing a beauty that calms in the midst of chaos, so my dress instantly brightens up my mood when I put it on, besides making me cool in the heat and proud to be wearing a style you don’t see elsewhere. I love being an individual and my sewing helps me silently proclaim this statement. What do your clothes say for you about you?